What did I like? Everything! This place is really good and perfectly located. I do recommend it! The welcome package is a really great idea! Check in is easy, building si secure, modern and clean. Apartment layout is very nice. Shower was great, nice water presure like a message. Comfortable bed, great location. We liked specially the space in the apartment and the technology provided. Well maintained apartment. Location is perfect to access the entire city. Nice localization, good comunication by tram and subway to old town. Apartment was grate , very clean , comfortable , bed and pilows perfect :) Prague is Awesome ! Apartment is well equipped, clean and max 30 min nice walk from old town. I liked the check in however I didn’t have my passport it would have made it quicker. Place is big enough, comfortable bed with extra sheets. Bathroom big and clean also equipped. They reacted quickly on our requests before the trip. 'MH Apartments River Prague' is a fantastic property located in a lovely area, approximately a 30 minute walk along the river to Prague city center. The facilities are all well functioning and easy to use. The beds are comfy, with the pull out bed being the winner of that category. I travelled with 5 other people to this apartment and everyone mentioned the shower afterwards as it was fantastic. There are some nice bars nearby with 'Brothers' seeming to be the best (we couldn't get a table because it was always too full, so make a reservation!). There are home comforts nearby, too. Tesco, Starbucks and McDonald's to name but a few. There are lockers on the ground floor to store luggage if you have a flight later on in the evening/night. All in all, a property we would stay at again if we were to travel to Prague once more. in general except the following case , everything was very good . Lock in a great price for MH Apartments River Prague – rated 8.9 by recent guests! 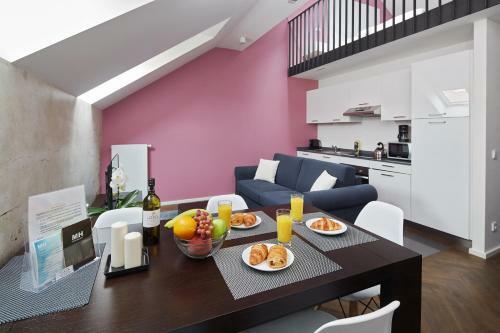 One of our top picks in Prague.MH Apartments River Prague offers spacious boutique apartments in Prague, in the area of Smíchov and Anděl. Many places of interest, such as Old Town Square, the Charles Bridge or the Castle can be reached within 15 minutes on foot. Free WiFi is offered throughout the property. All fully-equipped apartments are air conditioned and have a seating and dining area. They also feature 1 or 2 bedrooms, a flat-screen TV with international channels, a DVD player, a laptop safe and a Nespresso coffee machine. Towels are provided. Various shops, restaurants and bars, as well as a brewery, a cinema and industrial architecture can be found in the surroundings. Prague National Museum is 1.1 mi from the property. 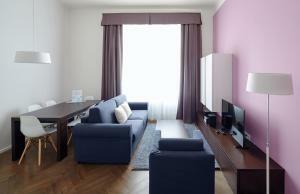 The nearest airport is Vaclav Havel Prague Airport, 6.8 mi from MH Apartments River Prague. When would you like to stay at MH Apartments River Prague? This apartment has a washing machine, kitchen and soundproofing. This apartment has a dining area, electric kettle and kitchenette. This apartment features a dining area, microwave and tumble dryer. 16 apartaments totally brand new from 2016 with plenty of features and facilities. We give all the comfort a guest can ask for. 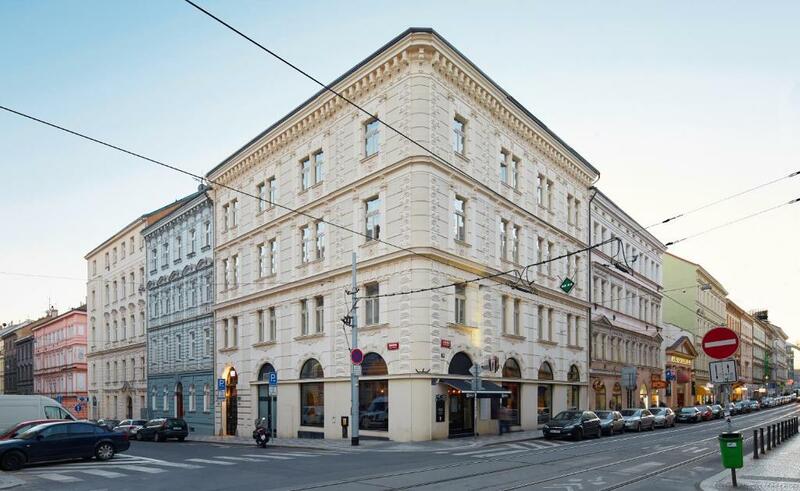 We are a company which grew up in Barcelona (Spain) and started a new experience in Prague with a new property in 2012 and now with this new opening in Prague 5. 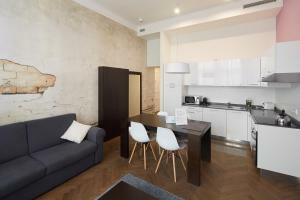 MH Apartments River Prague is located in the area of ​​Smíchov , and emerging residential area of ​​Prague famous for having shopping malls, a brewery, industrial architecture, cinema, stylish restaurants, bars and varied nightlife. Smíchov is located on the west bank of the Vltava river . 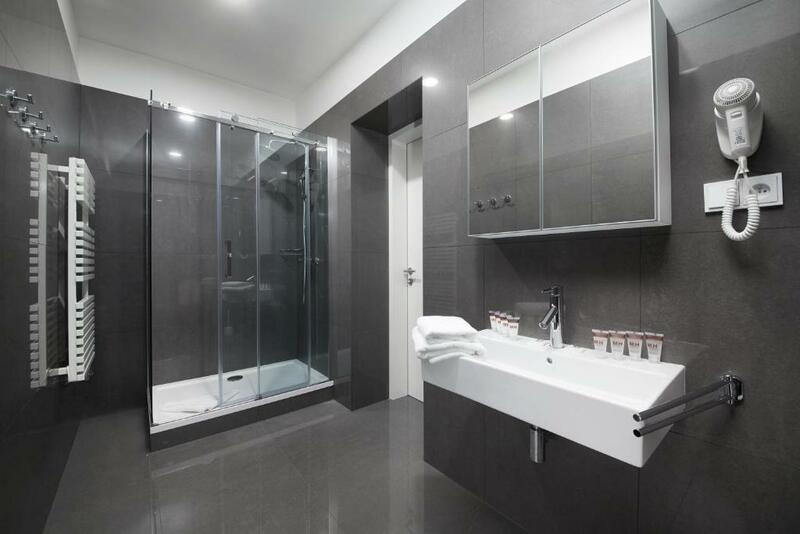 House Rules MH Apartments River Prague takes special requests – add in the next step! MH Apartments River Prague accepts these cards and reserves the right to temporarily hold an amount prior to arrival. Please contact the property 40 minutes before arrival for check-in instructions. Check-in is done via a machine at the property. Contact details are stated at the booking confirmation. Since the place is big it took longer to make it warm. But the extra blanket compensated it. its is unacceptable that the apartment was without sleepers in without carpets rooms . and when i request this from the hotel manager they told me that they cannot do anything about . how much cost this ? 1 eur ????? !!!!!!!! . The communication with the accomodation was fast but ineffective. I asked in advance for a high chair and was told there will be one in the room. On arrival there was none-I asked the reception and they said they would bring one. Instead they delivered baby cot (which was broken and dangerous for a baby). I reported it and asked for the cot to be taken away-they didn't do that.The corners and skirting boards need more attention dusting. There is no anti-slip bath mat available, shocking really since it is a basic health and safety equipment in most hotels. The courtyard is quiet (bedroom window of apt.24 faced courtyard) but there are outlets from local eateries' aircon into the courtyard so it is not really possible to get fresh air into the bedroom as it smells of fried food. Very thin pillows-not comfy. Got woken up at 2am on Friday night by very loud music-probably in the apartments near by or somewhere...luckily someone intrvened and it got shut down about 20mins later. Lovely location, reasonably clean, very well equiped-including home cleaning kit, iron, safe, washer-dryer (essential with kids), working lift, secure and modern. Comfy beds. Aircon. Working heating and spacious fridge/freezer. The road it is on is quiet. Snacks on arrival nice touch. It was a good value for money for last minute trip with our young son-I would book again but not in the summer as opening the windows will let all the city smells in. The sloping ceilings that we bumped our head on on the mezzanine main bedroom level. Windows in roof space as we stayed in an attic apartment so no view. Really lovely very modern, clean, spacious and comfortable apartment. Tram stop outside apartment building and a quick ride into town (under 10 minutes). To walk into town took about 35 minutes. Only few minutes walk to the train station and train only few stops into town. We loved the location of this apartment. Can be a bit of road noise. Great accomodation in a great spot on the map.